A while ago, I posted a link to 33+ moving tips, but apparently that just wasn’t enough. 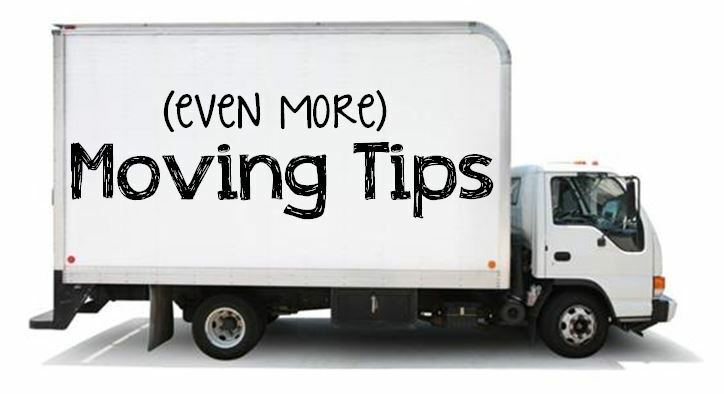 Yes, that’s right, it’s time for even more moving tips. Because you need them. And it’s important not to forget little things while doing something big, like moving. Have water or Gatorade or something for the movers to drink. I had packed up everything and cleaned out my fridge already, and was caught off guard when the movers in St. Louis asked for something to drink. Why on Earth would they be thirsty? They were only going up and down a flight of stairs carrying really heavy things over and over again… I guess I assumed they would bring their own? They didn’t. Thankfully my mom had a couple of Vitamin Waters in the car that we gave them. Be sure to have a few water bottles set aside just in case. Have a tip for the movers. And not the corny ‘tip’ like “don’t eat yellow snow” (admit it, a few of you thought of that one just now…), but dolla dolla bills, y’all. This I did have ready to go, but I wanted to make sure to mention it. I know that movers are expensive and you’re already paying an arm and a leg, but it’s a nice (and expected) gesture for the people doing the heavy lifting. Make sure to have equal bills for everyone involved (2 $10s for 2 people instead of 1 $20 that they need to figure out how to split, for example). Have plastic mattress covers! Thank you, mom, for getting these for me because I had no idea I needed them. Really she got them for the move that she and my dad are making over the next few weeks, but she let me use them. This was the first time I had my own bed to move and I just had no clue! Be sure to have rope or tie downs for all of your stuff in the moving truck (that is if the movers don’t provide them). The movers that unloaded the truck were very impressed at how nicely all my stuff stayed in place- I guess that isn’t always the case and stuff flies everywhere. If you’re driving a moving truck yourself, have a padlock for that thing! This was another thing that I just hadn’t thought about, so we had to buy one the day of the move. Thankfully there was an Ace Hardware right by my apartment! Have lots of old blankets to cover your furniture. My parents have moved quite a few times in their lives and so they have a LOT of moving blankets, army blankets, and old comforters that I was able to use. It made all the difference. Charge your cell phone before the movers get there. This one is pretty obvious, but it’s one less thing to worry about, you won’t accidentally leave your charger behind on the kitchen counter, the movers won’t accidentally trip over the cord… you see my point. I won’t be needing these tips anytime soon, hopefully. I’m really loving Dallas so far and hope to stay here for a good, long time! Also I hate packing. And even more than that, I hate unpacking. I am SO SLOW when it comes to unpacking. So I’ll probably just stay in this apartment forever and die here. Sound good? Good.